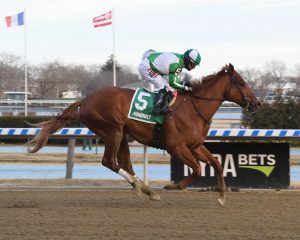 First to strike the lead and first to cross the finish line, Mr. Buff dominated the field of Aqueduct’s featured $100,000 Jazil Stakes for 4-year-olds and up at 1 1/8-miles Saturday. 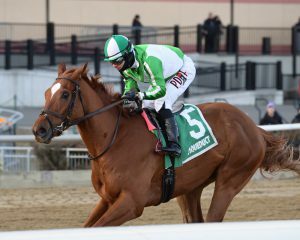 This was a second straight stakes win – and fourth consecutive victory – for Chester and Mary Broman’s 5-year-old gelding, who is a third-generation homebred through the male line. Mr. Buff is sired by the couple’s homebred multiple stakes winner Friend or Foe, who stands stud at Smallwood Farm in Virginia. His sire, in turn, is Grade 1 Florida Derby winning Broman homebred Friends Lake. Reunited with jockey Junior Alvarado, who was aboard Mr. Buff for a pair of races last March and April, and bet down to the 7-2, second choice in the wagering behind 1-2 Sunny Ridge, the speedy Mr. Buff surprised no one when he hit the ground running. By the time the field of six rounded the clubhouse turn, the chestnut had established a 1 1/2-length lead. Ticking off temperate early splits of 25.05 and 49.90, Mr. Buff preserved a comfortable one-length advantage over Thebigfundamental who tracked in second in the two-path and Sunny Ridge who tracked another half-length back three-wide along the backstretch. In the far turn Mr. Buff’s pursuers geared up to deliver a challenge and closed ranks, while Sunny Ridge advanced into second. Just past the quarter pole, however, Mr. Buff sealed the deal. Alvarado recounted an easy ride for him and picture-perfect performance by his mount. A winner of eight races from 26 career starts with six seconds and three thirds for trainer John Kimmel, Mr. Buff pushed his earnings over the half-million dollar threshold with the Jazil score ($540,786). Mr. Buff’s dam is Speightful Affair (Speightstown), a graded stakes placed Ontario-bred who was purchased by Chester and Mary Broman for $80,000 at the Fasig-Tipton 2013 winter mixed sale. Her first foal, Organic Gemini who was bred in New York by Turtle Bird Stable (FO 2012), is a stakes placed runner and all three foals to start are winners. In 2018 Speightful Affair produced a full sister to Mr. Buff and has been bred back to Friend or Foe.